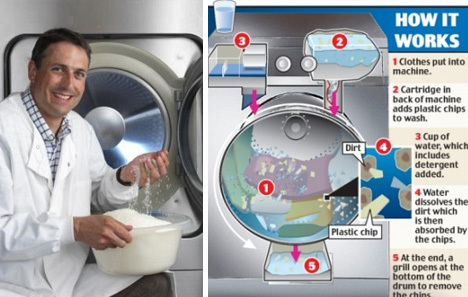 Forget about home for a moment: just imagine the cost savings (not to mention sustainability benefits) of large-scale, mass-washing operations (from laundromats and dry-cleaners to hotels and more) of using ninety percent less water per washed load of linens or clothes. This strange industrial design solution from Xeros acts at a level almost too small to see: tiny reusable beads that look like grains of rice. 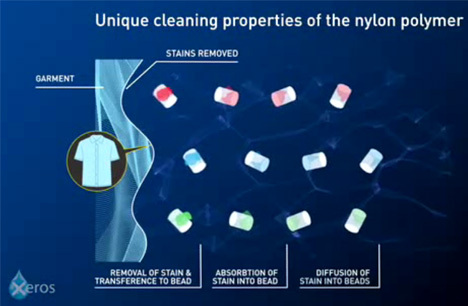 A handful of these tossed into a load of laundry essentially soaks up stains, which in turn spread into the beads and allow their surfaces to work the same way for another hundred loads. The beads drop down into a separate storage container after the wash cycle and through a spin cycle, slipping through the holes in the drum and allowing the clothes to be removed relatively (or hopefully entirely) bead-free. 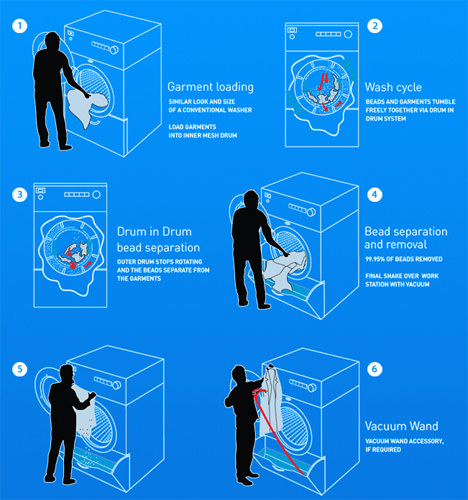 The result: clothes as clean as a normal washing machine would make them but with a third less energy and nine-tenths less water required.